Just astounding shot. Love the dark dramatic sky and the bright strong colors of the kites. Beautiful! 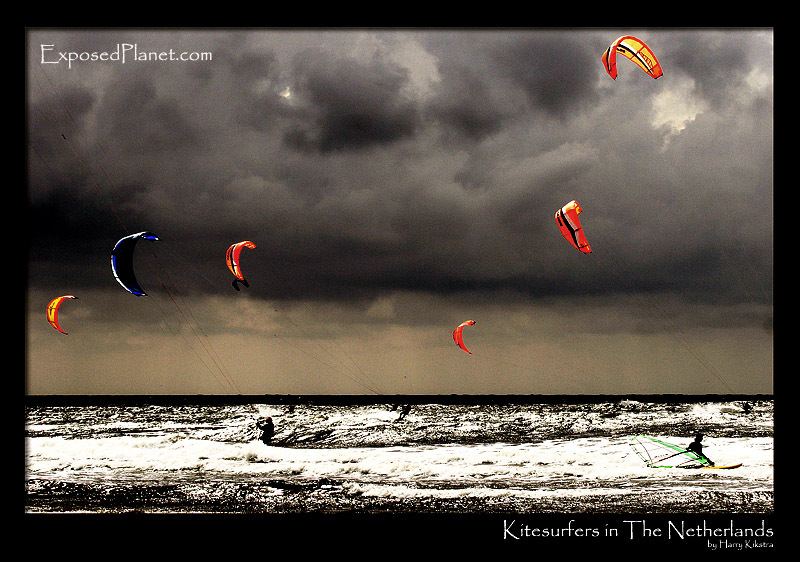 The story behind "Kitesurfers in the Netherlands"
But the skies were dark while the surfers were catching the light in the fluorescent sails. Kitesurfing is getting really popular nowadays and my friends have even gotten me to stand (well..) on a board for at least half a second! It is fun though and a good example of the available energy. If the weather is clear here you can see a long line of modern windmills standing at the horizon; a new park to grab some of the available energy. A wonderful sight and a step in the right direction. But there is no reason not to combine responsibility and joy of life. Play in the sunshine! Ok, I pushed the processing a bit :)But the skies were dark while the surfers were catching the light in the fluorescent sails. Kitesurfing is getting really popular nowadays and my friends have even gotten me to stand (well..) on a board for at least half a second! It is fun though and a good example of the available energy.